With art school training and a background in antiques and decorative textiles, Mary Pytel set up Wyebridge Interiors in Hereford in 1987. The business quickly became the city’s leading interior design showroom. 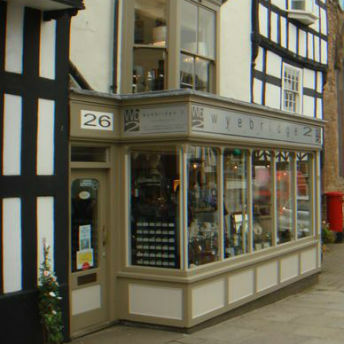 In 1997 Mary branched out, opening another shop in the thriving Herefordshire market town of Ledbury. Wyebridge 2 is now a successful home interiors, accessories and gift shop, offering a blend of unusual artefacts and attracting a wide range of customers and clients from many parts of the country. Mary enjoys, and takes the utmost care, in obtaining the best quality products from a diverse range of international craftsmen and suppliers. When a barn became available behind the shop, she was keen to purchase and convert it into a new, bigger, space with coffee shop and art gallery. Mary’s husband, Walenty Pytel, is a unique contemporary artist, internationally renowned as Europe’s leading metal sculptor of birds and beasts. Included among his many prestigious international works is the 28ft sculpture of Three Egrets at Birmingham International Airport, which commemorate forty years of peace in Europe. Mary was keen to exhibit some of his smaller works in the gallery.